The famed Maroon Bells near Aspen provide a scenic, if not geographically confused, background for the autumn edition of the Four Corners Real Estate Guide. This perplexing peak placement piqued Action Line’s interest. It also offers the chance to make a molehill out of a mountain. When you live in a state with the 30 highest major summits of the Rocky Mountains, you tend to get possessive and picky about your backyard. Just ask former U.S. Senate hopeful Bob Schaffer. Back in 2008, he released his campaign’s first TV ad, touting his connect to Colorado. Schaffer said he proposed to his wife atop Pikes Peak and the ad showed the celebrated mountain. Only it wasn’t Pikes Peak. The ad depicted Alaska’s Mount McKinley, also called Denali. Much of Washington is reclaimed swampland. No wonder people there see mountains as pretty much the same. Understanding Colorado geography is an uphill battle, and that’s how the recently published glossy Four Corners Real Estate Guide went off-trail in featuring an Aspen panorama. The view’s mighty nice. But it ain’t the Four Corners. What’s behind this non-peak performance? “The answer is pretty simple,” said David Habrat, vice president of news and directories at Ballantine Communications Inc.
And finally, there is the curse of publication deadlines. In any case, instead of saying “hell’s bells,” he makes an appealing observation that rings true. “Thank goodness our savvy readers are fond of pointing out these sorts of mistakes,” he said. The problem isn’t unique to Ballantine Media. “Who can forget the truly outrageous picture on a Durango Magazine cover where a young girl was photographed picking wildflowers, thereby causing a collective gasp?” David pointed out. In any case, “send us your great photos, and we’ll send our staff out on more hikes so they might come to understand that Barnroof Point is not really on a barn,” David said. That’s the real story. Of course, there are other theories because we are in the Era of Alternative Facts. 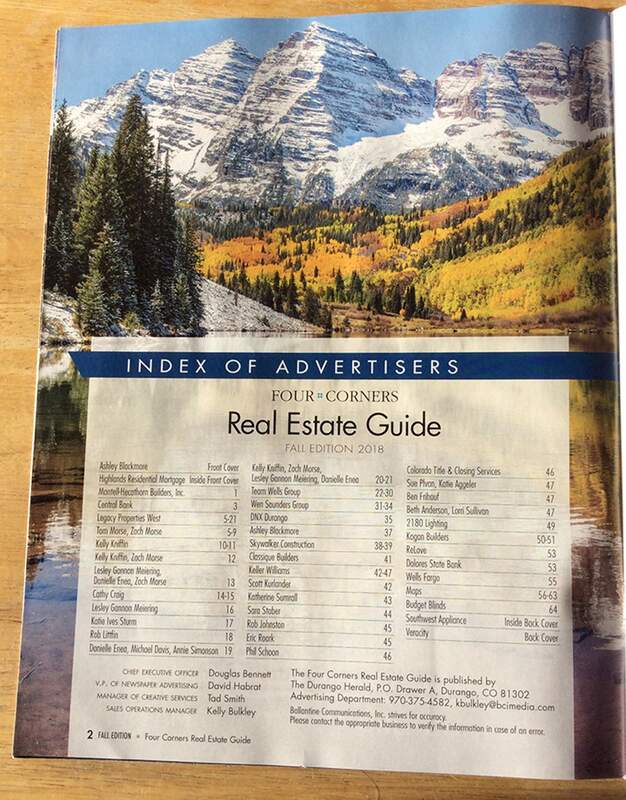 For instance, using Pitkin County imagery for a local real estate guide indisputably proves that Durango Realtors have conspired to turn this place into Aspen. Why not go all out and have a Malibu beach scene in the next Four Corners Real Estate Guide? It would confirm that the Californication of Colorado is complete. After all, Oxford is but a mere four letters away from Oxnard. Meanwhile, traffic on U.S. Highway 550/160 gives Golden State transplants a nostalgic taste of home. Email questions to actionline@durangoherald.com or mail them to Action Line, The Durango Herald, 1275 Main Ave., Durango, CO 81301. You can ask for anonymity if you can explain why La Plata County insists it’s a unique place but has six Aspen Drives, three Aspen Lanes, an Aspen Court and an Aspen Place.